1. The Body Shop Spa Wisdom Africa Ximenia & Salt Scrub – I love love love this. Not a face scrub but a body scrub. This balmy scrub with its amazing smell can relax you anytime. You can read everything about it here. I finished it this month. Price - 1650 INR for 350 gm and it lasted for around 2.5 years!!! 2. Iraya Cocoa & Milk Fresh Face Masque – I like this one but not love it. Surely there is nothing impressive about it. There are issues with this one like – no ingredients list, not available easily. Also, it lasts only a month. I have kept mine in fridge the all time and luckily it last much much longer that way. Repurchase - Well, finding this a big problem as there are no stores in my city and it is not available online. There is nothing great about this which will make me force someone in Delhi to send it to me. Price - 175 INR for 100 gms. 3. St Ives Apricot Cleanser – St Ives Scrubs are great so, when the SA showed me this cleanser to control oil, I grabbed it. It’s a very creamy cleanser with micro beads for mild cleansing effect. The beads are not abrasive. Works great for sensitive skin. I love the smell. Controls Oil to some extent. Repurchase – This product is not available in normal stores in India. I got it from a shop that stores imported products. I do not know if I will be able to find the exact same variant again in India. Price – Do not remember. 4. Lotus Herbals Claywhite Black Clay Skin Whitening Face Pack – It is my ‘Avatar’ face mask. Not that I cannot live without it but I ended repurchasing it many times. It does add a glow to face but basically it’s a clay mask with added blue color. Also, it dries very slowly. 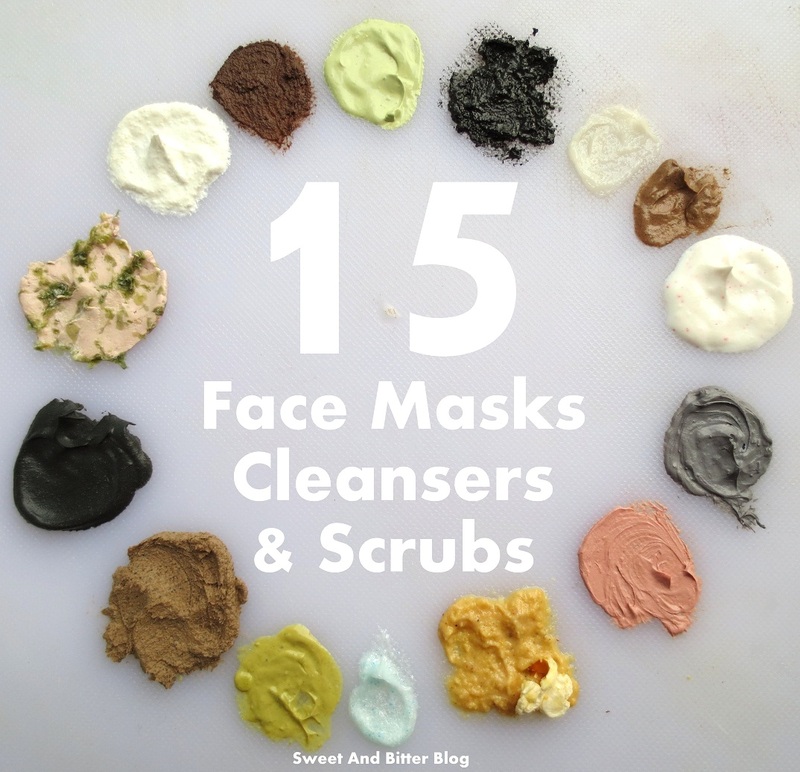 It takes around 15-20 minutes most times which is the longest of all face masks I have. I like it when I just need something on my face to relax. No long term effects for this. Repurchase- I discovered it back in 2008. I have repurchased it now and then but not back to back exactly. I repurchased it last year because I skin became too oily all of a sudden. I thought a clay mask will calm down my skin but it did nothing to control oil. As of now, I am not going to buy it for a long long time. I finished it this month. 5. Lotus Herbals De-tan After Sun Face Pack –Last Spring, I got so much tan from my holidays in Andaman, that my neighbors could not recognize me. I had to do something. Instead of using the well tried and effective ‘lemons and flour pack’, I thought of trying something ready made. I got it because I saw Titanium Dioxide in the ingredients list and thought at least this will go some good. Alas, it didn't. It has been lying in my bathroom shelve for a year now. I tried to finish it this month and I succeeded. Price – 245 INR for 100 gms. 6. Lush Let the Good Time Roll (Cleanser) – This is a major love of me for the nice smell. I got it for me around Christmas and I use it almost every day. The tub lives in fridge and a part of it is in my hand bag. I use it after I reach office to remove all the dirt. This is a very mild cleanser with a great smell. I was apprehensive about using it for summer as it has high oil content but I do not have to worry as I have to live more than 10 hours a day in the harsh office AC. You can read the entire review here. I also used Cetaphil as mixing medium when I see any acne putting up a ‘coming soon’ banner on my face. Repurchase – I was afraid that this is a LE but its permanent now. I am surely doing to get it back to back. Price - 500 INR for 100gms. I got around Christmas and it is almost 5 months now. Even after 5 months, I have hardly used 30-40 gms of the cleanser. This is a serious value for money. Repurchase – This was a PR sample. I do not think I will get the exact same thing again. There are a number of similar scrubs in market. 8. Iraya Green (Tea) Cucumber Face Mask – This has a beautiful smell and I do like it. My face looks brighter the next day. If there is a special day then I try to use it the night before. It has the same issue as all Iraya masks – there is no ingredients list, not easily available. One of my friends got this and she said that it might contain bleach as it made her fair like bleach does. She also added that it lightened the color of facial hair. I never saw much difference but her thoughts really made me scared of this mask. 9. Iraya Walnut Scrub – This Walnut Scrub..ohh wait..or was it Apricot? Well, I do not remember. Is there a way to know? NO! Because, there is no details about it in their website and the pack does not even have a label. GO figure. It’s a very average scrub with nothing over the top. 10. Blossom Kocher Aroma magic Bamboo Charcoal (Face Mask) – The first regret product of the year. It also dries slowly like Lotus Clay White but then it does not add any glow. Actually, I am yet to see what it actually does other than making my wash basin dirty. You can see the review here. Repurchase – Even if a psycho aliens points a gun at me, I won't buy this. Price – 380 INR for 100 gms. 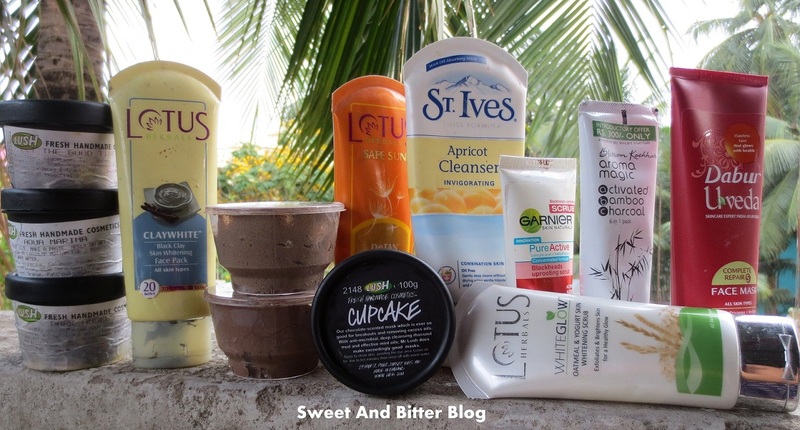 Repurchase – On my 3rd Tub now. And I have used hardly 15-20grms of the 3rd tub. Just 2 tubs for 1 year is impressive. Price – 585 INR for 100 gms. 12. Lotus Herbals White Glow Oatmeal & Yogurt Skin Whitening Scrub - I love this. I did a detailed post of this as I just realized this deserves a single post of its own. You can read it here. Repurchase – Lost count! I think I discovered this 2 years back and I have always had this with me. Price - Rs 165 INR for 100 gm. 13. 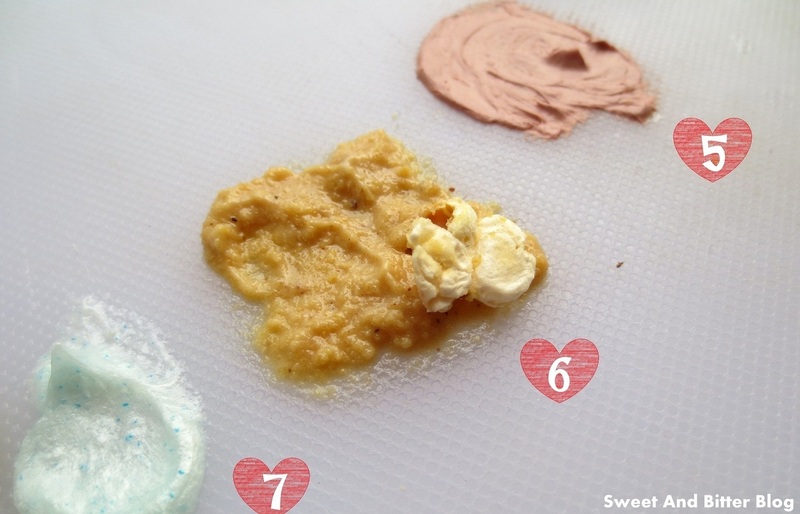 Lush Cupcake (Face Mask) – This was one my indulgent buys. I have used cosmetic warrior and brazen honey and none impressed me at all. But, Cupcake soothes irritated skin and reduces the redness of pimples. Smells like chocolate. Good even for sensitive skin. Repurchase – This is my first and it’s about to get over. I might end up having this one in my empties post. I will get another soon. Price Rs 480 INR for 100 gm. This by the way is the cheapest fresh face mask from Lush. 14. Dabur Uveda 5 in 1 (Face Mask) – This was what a pushy SA forced me to buy and I ended up loving it. The smell is different – not good not bad – different. It does wonders for my skin. You can even dilute it and use to make it last longer. I absolutely love this and this is my third or fourth purchase. Unluckily, this present bottle is irritating my skin. The light tingling sensation is not light – its too much too bear. Maybe, this one is from a bad batch. Also, I found that when I kept it for long, it leaked green liquid – no idea what is wrong with this tube. Otherwise, this really is a great mask. And it actually works. I went over board and have got the ‘tightening’ one from this range but that was just a simple mask with loads of artificial sandal smell. Repurchase – Already my 3rd -4th bottle. I am worried how to finish ‘this’ one as it stings a lot for me. Maybe I should just throw it away or finish it up as a body mask. Price – 185 gm for 100gm. 15 . Lush Dark Angels (Scrub) – This scrub means business. Simple and straight – loads of granules – not harsh even for sensitive skin. Period. Repurchase This is my first and I intent to buy this one back to back. Price – 700 for 100 gm. This is required in very small quantity and hence, I have not used even used 25 gm of the product in 5 months. I keep this in fridge to make it last long. And even after all this, I missed one of my favorite cleansers - Cetaphil. Which is you favorite cleanser/face mask/scrub? I want to know what are your favorites. You can try Lush Aqua Marina or Herbalism. The best bet is to consult the guys in the store. They are really helpful (at times). Just keep away from the pushy pushy ones. I always had dry skin. The best thing to do for skin was to scrub, apply face mask and moisturize. So, I always end up buying a lot of them. And you know what? I missed many other cleanser that I am using in this post. Actually, this post has more of products you must stay away from than must haves. I didnt know "Let the good times roll" was made permanent.. Thanks alot, gonna get that again..
Quite a comprehensive post. love the way uv given the gist of the products in ur short reviews. Thanks Dollie for liking the post. It was turning out too big but I tried to keep it short. Glad that it helped. Thanks for appreciating. Its very sweet of you.